to spotlight eagerly-anticipated upcoming releases. So far, I haven't picked up a Denise Hunter romance that I haven't loved, and I always look forward to reading her newest release. Only a few weeks until Blue Ridge Sunrise (starting a new series!) releases, and I'm so excited. Former free spirit Zoe Collins swore she’d never again set foot in Copper Creek or speak to the man who broke her heart. 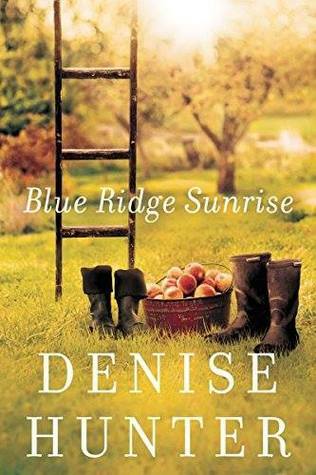 But return she must when her beloved Granny dies, leaving the family legacy to Zoe—a peach orchard nestled at the base of the Blue Ridge Mountains. As life-changing decisions and a history with Cruz hang over Zoe’s head, tensions rise between her and Kyle. Even as she comes to terms with the shifting relationships in her life, Zoe still isn’t sure if she can remain in Copper Creek with her new responsibilities... and her first love. For what book are you waiting this week? What a serene cover. Thanks for sharing it! Such a beautiful cover! Great pick! Oh I love small town romances and this could be set in my backyard :) Adding it to my TBR. Thanks for sharing! This seems such a cute romance. I hope it lives up to your expectations and you love it as much as you loved the other books you've read by Denise Hunter. Small ton romances are so nice to read and this one sounds amazing. Thanks for sharing it.